Prior to the Boot Camp, AmSpa will present a special after-hours tour of the Lasky Aesthetics & Laser Center, one of the most successful medical spas in the United States. This event, which is sponsored by BTL Aesthetics, takes place from 5:30 – 7:30 p.m. PST and will show attendees how this well-appointed practice makes its clients comfortable while providing a high standard of service. Space for this exciting event is limited, so click here to register. 9 – 10:30 a.m.: The Plan, presented by Bryan Durocher (Durocher Enterprises)—What are the most effective ways to develop a business plan for your medical spa? Medical Spa Consultant Bryan Durocher discusses the ins and outs of the planning process and helps determine how long it realistically takes to open a practice. 11 a.m. – 12 p.m.: The Marketing Plan and Social Media, presented by Brandon and Jenny Robinson (Skin Body Soul MedSpa)—This session will help you determine how to most effectively market your medical aesthetic practice using both traditional methods and cutting-edge techniques. 1 – 1:30 p.m.: Medical Aesthetic Hot Topics Panel, featuring Toni Lee Roldan-Ortiz (Environ Skincare) and Tim Sawyer (Crystal Clear Digital Marketing)—This panel, moderated by yours truly, will feature a spirited discussion of the current issues and events that concern medical spa owners and operators. 1:30 – 3:30 p.m.: The Law, presented by Alex Thiersch (AmSpa) and Michael Byrd (ByrdAdatto)—In this presentation, we’ll discuss the long-standing and emerging legal issues that every medical spa owner needs to know about. As you can imagine, there is a lot to cover here, since new concerns seem to be arising daily lately. 4:15 – 5 p.m.: The Treatments, presented by Terri Ross (Lasky Aesthetics)—Learn about the most profitable and popular treatments available to your practice, and find out how to best determine which treatments are right for you based on the state of your practice. 5 – 6 p.m.: The Digital Marketing Ecosystem, presented by Tim Sawyer (Crystal Clear Digital Marketing)—Find out how to effectively spread the word about your medical aesthetic practice and how best to determine what’s working and what’s not. Your practice’s digital presence is more important than ever before, and curating it should be a top priority. Saturday will wrap up with a cocktail reception from 6 – 7:30 p.m.
Once again, the Boot Camp begins at 8 a.m. with a breakfast. 8:30 – 9 a.m.: Anatomy of a $5-Million Med Spa, presented by Alex Thiersch (AmSpa)—Have you ever wondered what the difference is between your medical spa and one that’s mega-successful? It might be less significant than you think. This presentation will show what a $5-million med spa is doing right—and what you might be doing wrong. 9 – 10 a.m.: The Financials, presented by Bryan Durocher (Durocher Enterprises)—At the end of the day, the money you’re bringing in is the most important measure of your practice’s success. This presentation will, among other things, demonstrate how to properly develop a budget and use metrics to determine your med spa’s strengths and weaknesses. 10:30 – 11:30 a.m.: The Long-term Revenue, presented by Brandon and Jenny Robinson (Skin Body Soul MedSpa)—Simply being successful isn’t enough for a medical aesthetic practice; you have to know how to maintain and grow your success. In this session, the Robinsons will show you how to build patient loyalty and move your business forward. 11:30 a.m. – 12:15 p.m.: The Consultation, presented by Terri Ross (Lasky Aesthetics)—As the old saying goes, you never get a second chance to make a first impression. Learn how to put your best foot forward with effective patient consultations—and how to turn them into consistent business. 1 – 2 p.m.: The Lessons, presented by Louis Frisina—Every medical spa is different, but the successful ones share several common traits. In this session, Business Strategy Consultant Louis Frisina discusses the qualities that are typically found in practices that bring in a significant amount of revenue. 2 – 3 p.m.: The Team, presented by Bryan Durocher (Durocher Enterprises)—A medical spa is only as good as its personnel, so it’s important to make sure that you hire a staff that can do everything you want it to—and more. In this session, you’ll learn about recruiting, hiring and retaining employees who can make your medical spa dreams come true. We hope you can join us in Los Angeles this weekend. 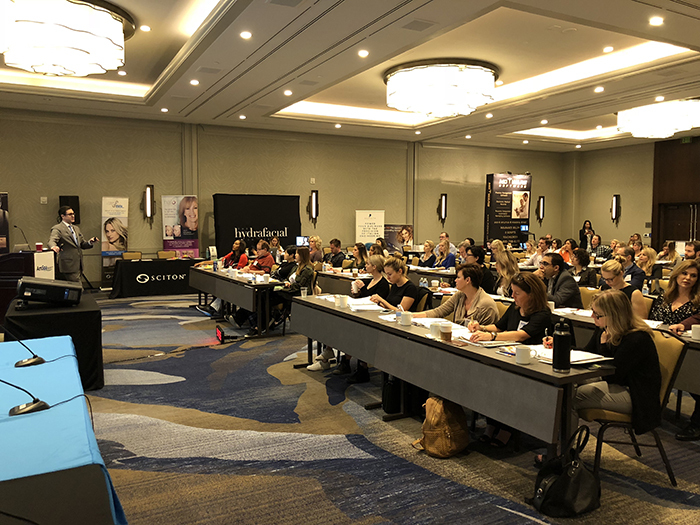 This AmSpa Boot Camp is a tremendous opportunity to get your medical aesthetic business headed in the right direction and learn some tips and tricks that can take it to the next level. Click here to register!